An absolutely unique example to add to your snuff box collection. Due to its small proportions and VERY pretty design; this small, burl wood circular snuff most likely created for a lady. Snuff was highly popular with ladies too! 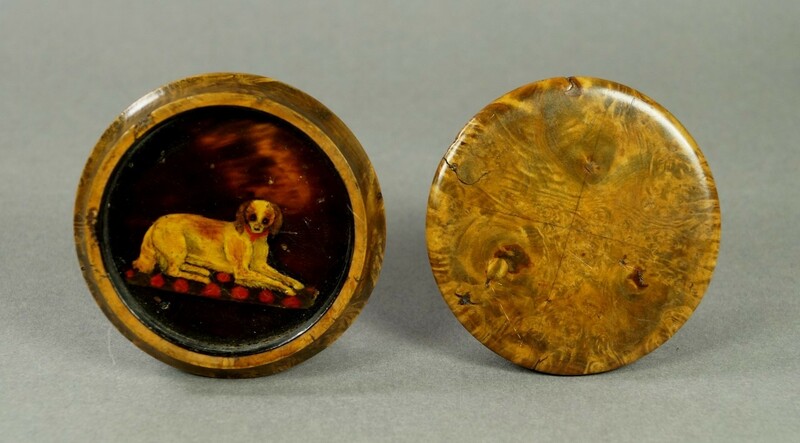 Dating to the 1800 to 1820 period, this small snuff box is hand carved from burr mulberry which has a wonderful mellow coloring and warm, smooth patina. The lid features a gorgeous gilt circular panel of high relief flowers within a basket, each flower hand enamelled. There is not any glass covering this central panel. To the underside of the lid is a beautiful hand painted portrait of a beloved pet spaniel recumbent on a tasselled cushion. This portrait is very old and we would think original to one of the first owners of this snuff box. The lid pushes on with a good, snug airtight fit. Size: Diameter 2.5" (6.5 cm) by 0.75" (2.5) high. Condition: Surface crazing to the portrait of the dog. Minor historic age nibbles to the wood seen in images. A unique and highly decorative early snuff box.